I am hoping by the end of this week our bathroom will finally be finished. The builders started at the beginning of August and have been coming by every so often ever since. Seriously when I have my own house and I need work doing I will be sure to move out whilst it is being carried out. Who would have thought a bathroom revamp would take so long. Anyway on a more positive note, after nearly 6 years of living here and at least 4 and half of those waiting for a (promised) new bathroom it will soon be finished. HOORAY!! They have taken everything away and replaced it with a new white suite. White tiles, white walls and soon to be wood effect vinyl flooring. It will look clean, refreshed and sparkling. I do need to tell you that before it was a peach suite with a bidet no less (ick!) and avocado green walls with mould, damp and crumbling walls and tiles. Oh and ugly brown flooring - it was quite simply horrific. With the luxury of everything being white, it will look so clean and minimal giving us room to throw in a few plants for colour and life. They took the bathroom cabinets away so we are stripped back to the basics - which is the perfect excuse to go shopping. We are going to purchase a white wooden cabinet to store our toiletries, paper and products in. This will be the perfect location for a plant or two to sit upon too. The room also needs a little seat or bench and I have loved the idea of a step stool for a while. 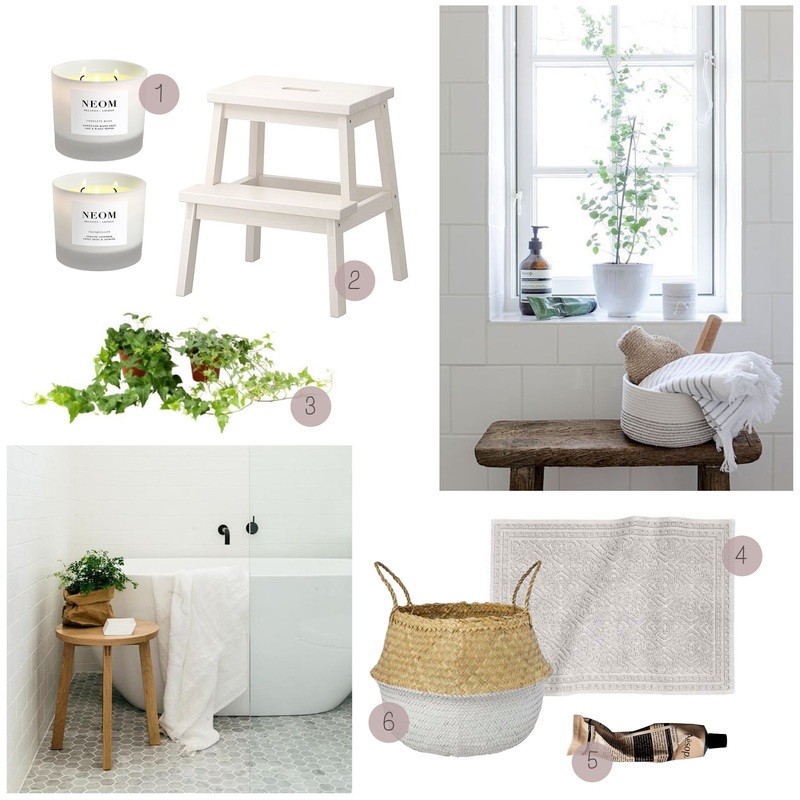 This super affordable one from Ikea can be used to sit on whilst I dry Olive, throw my clean clothes on or even use as a tiny table/shelf (as well as a step stool of course!). I'm also on the look out for a tall side table or something to have next to the sink for toothbrushes, hand cream and essentials. 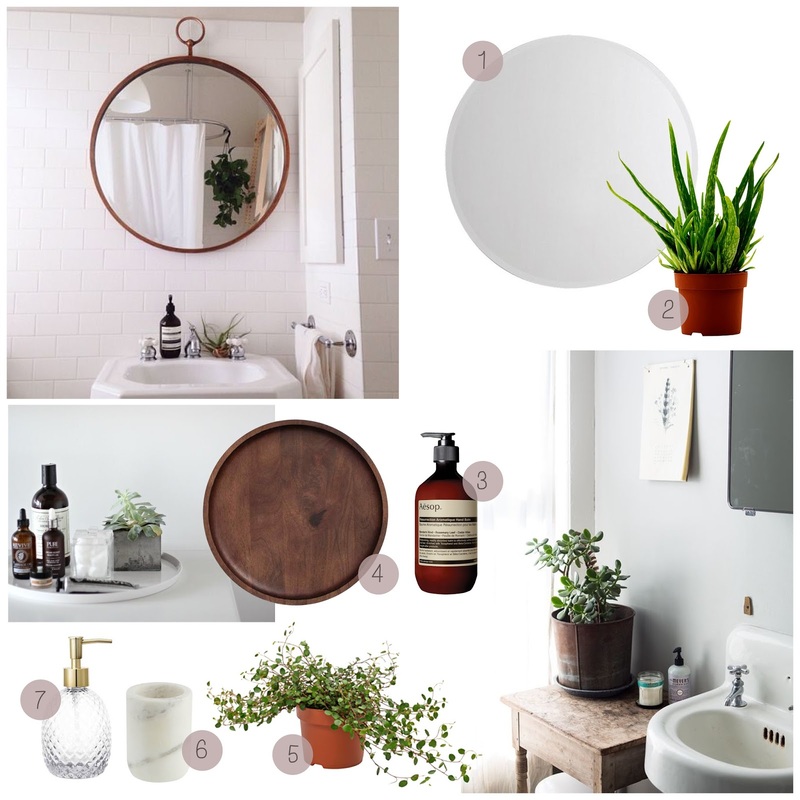 I love the look of a neat and tidy collection of items on a round tray and think it will finish the whole bathroom off nicely. Also, I am no fan of the mirror cabinet so keeping the essentials by the sink suits my eye better. And a big round mirror above the sink would be perfect. Do you have any affordable ideas for what we could use for that side table next to the sink? It would have to be relatively skinny too. Also, what plants would you recommend to get for the bathroom? -Ones that preferably I can keep alive!! Loving the white look. Sounds like you have some cute ideas, would love a nose when it's finished!